My home workspace is a 27″ Retina 5K iMac (2560×1440) paired with a vertical 4K display (scaled to view 1440×2560). While I love this setup in general, there’s one time it’s annoying: When I need to move the cursor between displays, and it’s located far away from its destination. There are many ways to solve this problem, including our own Keymo, which I still use when I want to teleport a drag across displays. But what I really wanted was a fast way to move the cursor to the other display when I switched to a window on the other display—because generally, if I’ve activated the window, I’m probably going to use the mouse in that window at some point. 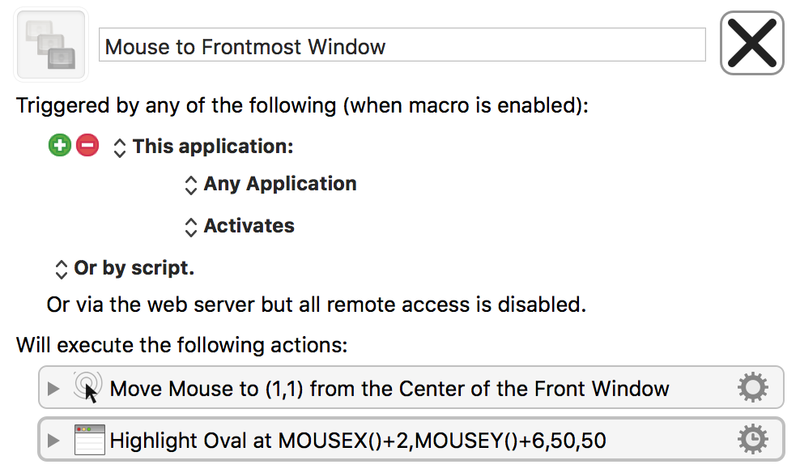 This macro will activate every time you switch applications, and then move the mouse to the center of that newly-frontmost window and highlight its location with a quick circle. Having tested this, however, I can say it’s a non-ideal solution: Most of the time when I switch an app, I do not want the cursor to move. I found it more annoying—much more annoying—than useful. 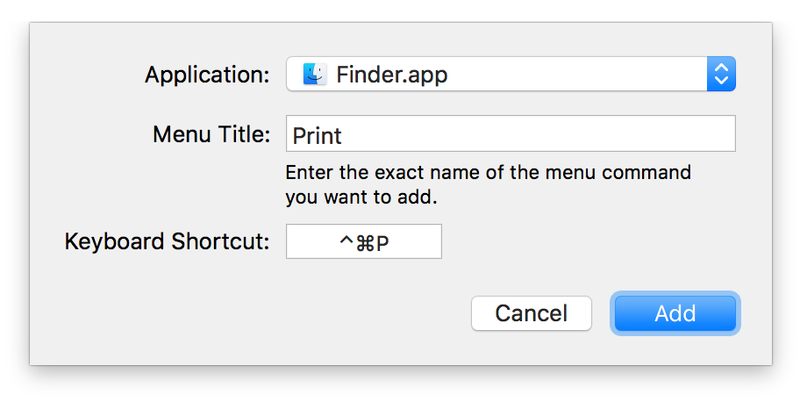 Just think, the root of thousands of "oh crud I printed instead of opened" errors lay in the 1874 QWERTY design decision to put O next to P.
The issue, of course, is the macOS ships with ⌘O (Open) and ⌘P (Print) as pre-assigned keyboard shortcuts in Finder. Select a bunch of files to open, reach for the O and miss by just a touch, and you’ve started a dozen print jobs. Whoops! And with that simple change, no more accidental print jobs. Because graphics are horrid for web searching, the text version of each shortcut, in alphabetical order, is shown below. Thanks to the commenters for pointing out the much easier way to do this: Select an item in Finder, then press Command-Option-C. All done. Leaving the hint here as an example of a Rube Goldberg machine. 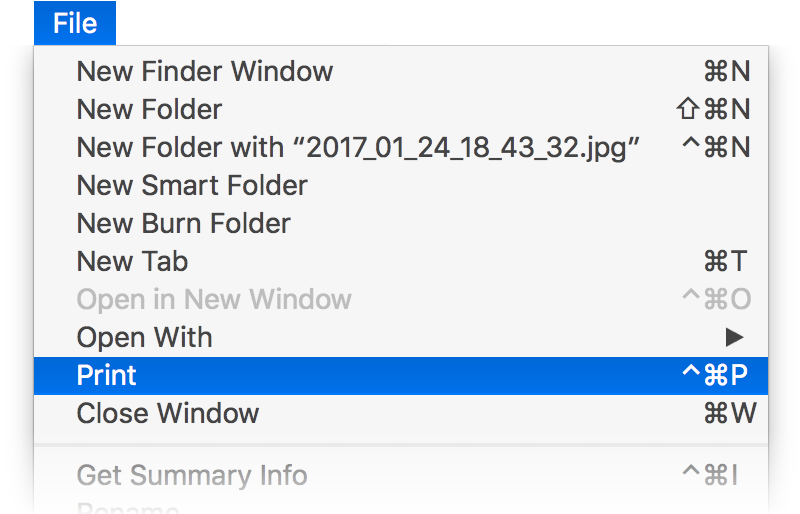 If you run that in Script Editor, you’ll see that your clipboard contains the path to whatever you had selected in Finder. 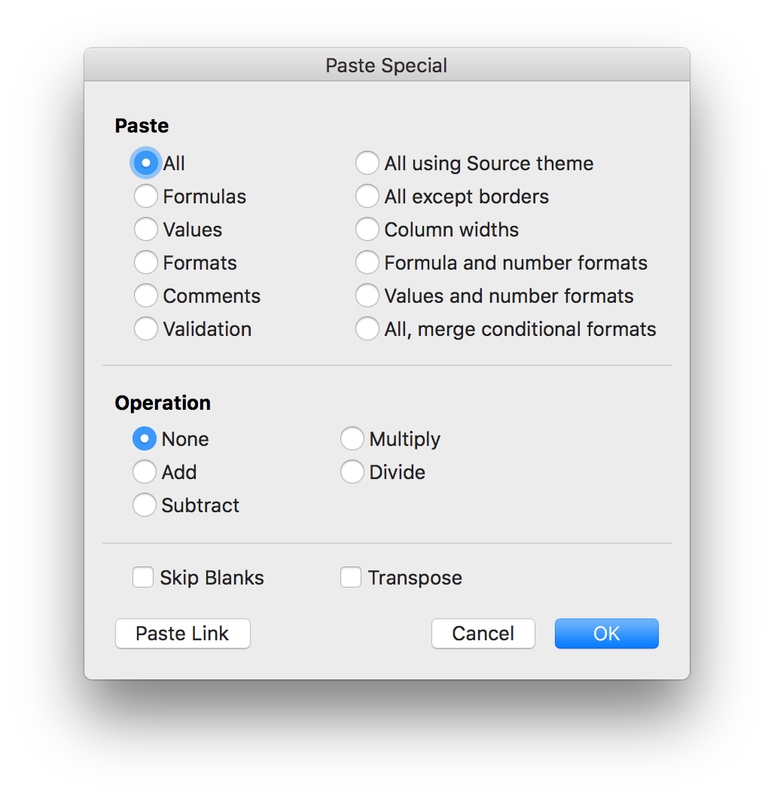 But running the AppleScript in ScriptEditor isn’t a great timesaver. Instead, put it into whatever tool you have that can run AppleScripts via hot key or menu bar entry or whatever. 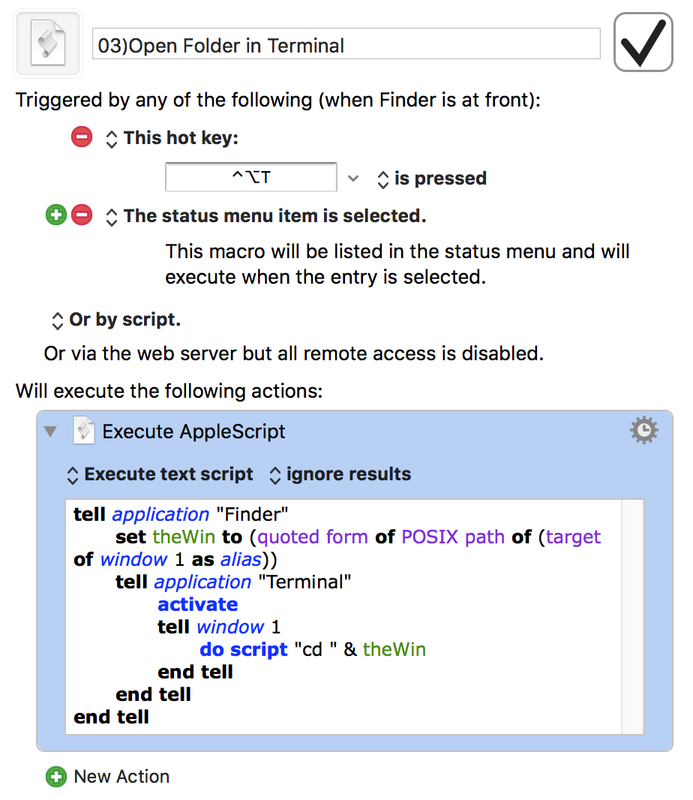 There are countless tools that can run AppleScripts in various ways, including our own Butler, LaunchBar if you save the script first, etc. 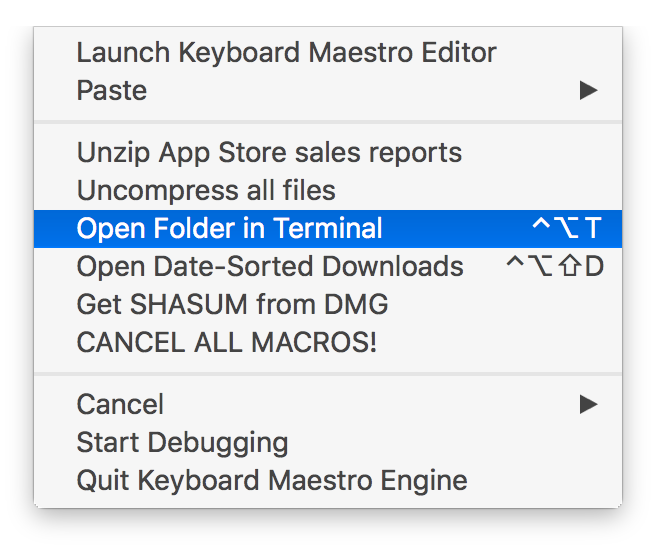 Today’s tip is just a re-implementation of a really old Mac OS X Hints AppleScript that lets you open a Terminal window with the working directory set to (i.e. cd‘d into) the selected Finder folder. This makes it really easy to jump into Terminal to do something from Finder, without having to do any mousing and minimal typing. 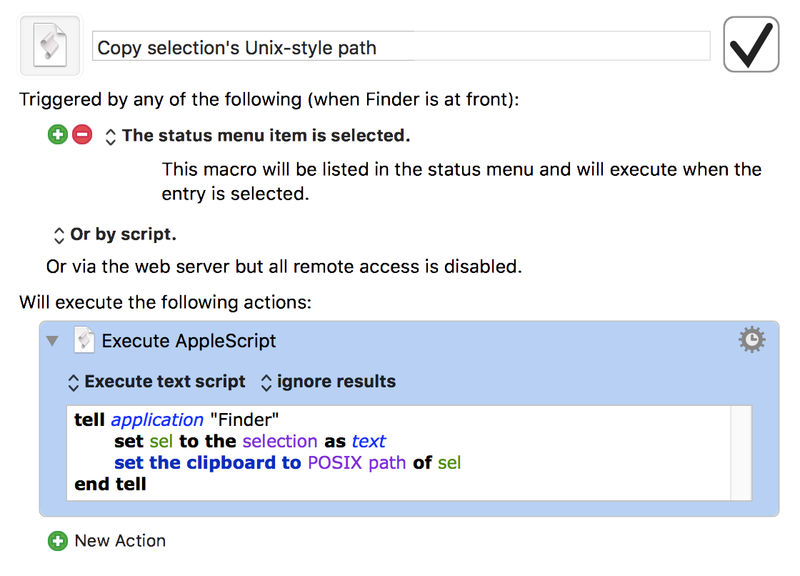 What’s new is that I’ve used Keyboard Maestro to turn the AppleScript into a macro that runs only in Finder, where it’s available via hot key or menu bar trigger. Keyboard Maestro also helpfully displays the assigned keyboard shortcut in the menu bar item, in case I’ve forgotten it. Late last year, just after its 14th birthday, Mac OS X Hints was officially put into a coma. The site exists online, but it’s no longer accepting hints, and exists in a static state. While it’s great that this information is still online—as there are tons of still-useful tidbits there—it’s apparently not searchable. When you enter something in the search box and press Enter, nothing happens…well, not nothing: The page reloads with an empty search box. Without search, the huge database isn’t quite so useful. The good news is that Google and Bing have indexed the static site, so you can use their search engines instead of the site’s search engine. Even better is that you can build complex queries that aren’t possible when searching directly on the site. site:hints.macworld.com network and “time machine” and mount: A Bing search for hints about mounting networked Time Machine drives. The use of “and” means that only hints with all of those words, and the phrase “time machine,” will appear in the results. site:hints.macworld.com “defaults write com.apple.Dock”: A Google search for all “defaults write” hints specific to the Dock. Note: The following is my unofficial eulogy for Mac OS X Hints; IDG has not announced any plans regarding the site, though I would hope they’ll leave it online, even if no new hints appear in the future. The site is now officially in read-only mode; there will be no new hints. So it’s officially comatose, at least. On this, the occasion of its 14th birthday, we’re gathered here to mark the passing of Mac OS X Hints. The simple truth is that the need for OS X hints has tapered off to near zero over the last 14 years. And that’s a good thing. At the time of launch, I knew nothing about content management systems or PHP; I knew enough HTML to be dangerous, and very little about anything else—including design, as you can see from the image at right. The site was all about the community; it was my intent from day one that it would be a users helping users site, not a “me telling the world what to do” site. The content management system I chose, Geeklog, has proven to be very long lived—fourteen years on, and it’s still what powers the site. In all that time, we had (I believe) exactly one hacking incident. Not bad. The site had a laser focus on hints; I’d do a pick of the week, but outside of that, it was all about the hints. So despite my poor design and lack of PHP skills, the site flourished. So much so that Macworld purchased the site and hired me in June of 2005. I spent nearly five years with Macworld, before leaving in 2010 to join Many Tricks. In looking back, never in my wildest dreams did I imagine the site would flourish to the point where it would actually change my career. 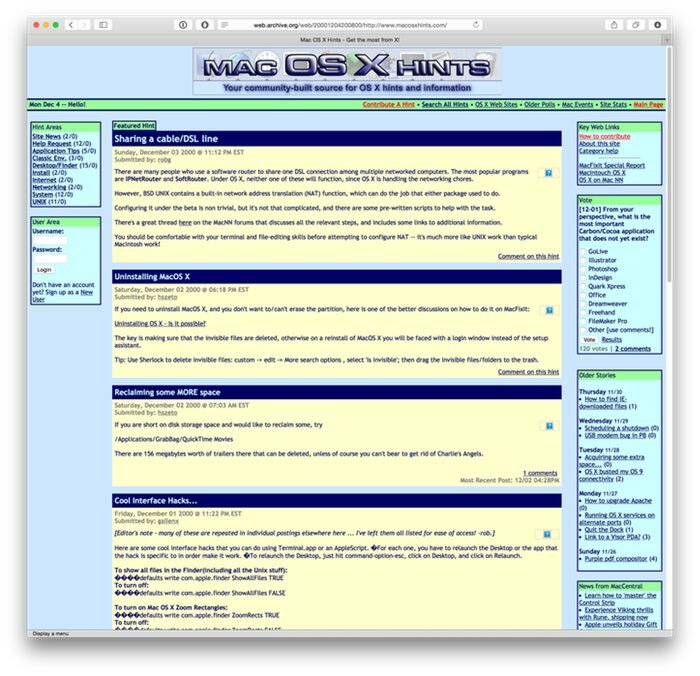 But it did, and for that, I’m eternally thankful to everyone who helped make macosxhints.com what it was. 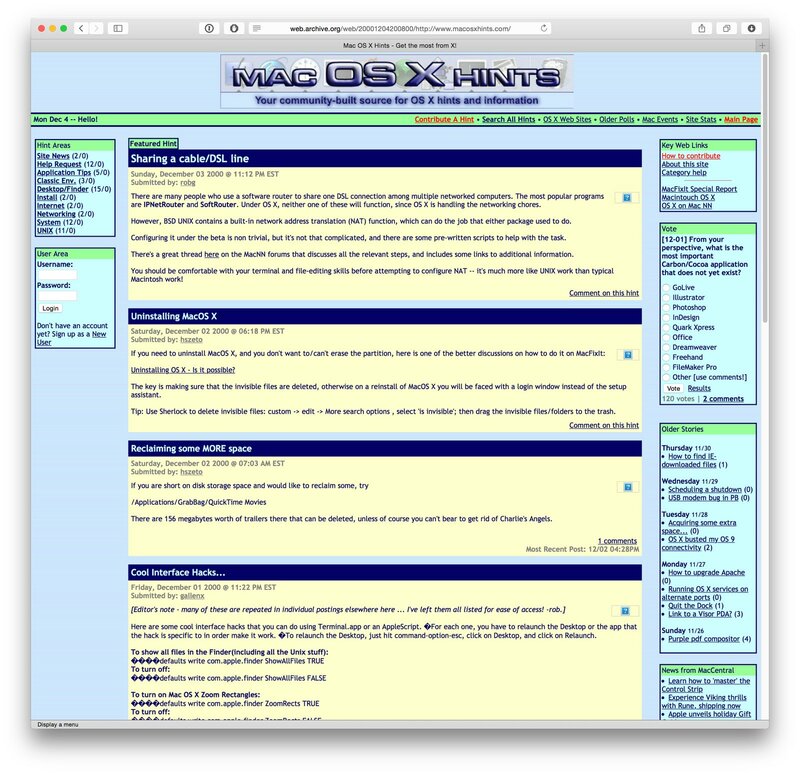 So happy birthday, Mac OS X Hints!